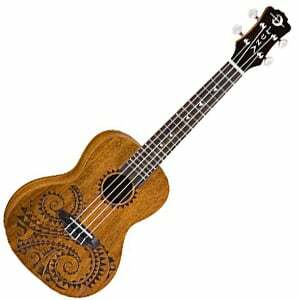 9 Best Beginner Ukuleles – How to Choose the Ideal Instrument for You! We took a good look at this important beginner’s chart and removed a few packs that we felt could be topped – such as the eMedia Ukulele Pack and Play Ukulele Today! Complete Kit. These were replaced with two brilliant Cordoba models in the Protege U100CM and the grown-up 15TM, and also added the wallet-friendly Pyle PUKT55 Soprano Ukulele. The humble ukulele has seen something of a renaissance over the past decade or so, and is now one of the hippest little instruments to play, and be seen playing. While guitarists love it, it’s also great for children and complete beginners to musical instruments, as the ukulele is easy to play and easy to learn. What is The Easiest Type of Ukulele to Play? How Much Should I Pay for a Ukulele? What Do You Need to Play Ukulele? But many questions will confront the beginner. What should you look for in a ukulele? Concert, soprano or tenor size? What brands are worth considering? How much should you should spend? And a lot more. So, to help, we have compiled a chart of some of the best starter instruments that will suit any budget. We have highlighted a few affordable ukes for those players just wanting to give it a go without spending too much; there are some convenient bundles that offer everything you need to get started; and even a few slightly more expensive models that will offer you advanced playability and sound. A durable American-made concert uke with a unique style. A quality bundle offering everything you need to master the ukulele. Great quality and huge value from this delightful Lohanu ukulele. A beautiful sound from this excellent tenor uke. A wallet-friendly Kala uke with an impressive sound! An extroverted soprano ukulele from the budget brand Pyle. No-frills, but a decent uke from Mitchell – perfect for beginner hands. A budget beauty from Luna Guitars that will appeal to beginners thanks to its unique styling and nice feel. It features a full-size concert body (23” long), with laminated mahogany used on the top, back and sides. The top is decorated with an elaborate Hawaiian body ornamentation-inspired tattoo, while other style points – such as shark tooth inlays – really enhance its appeal. As we mention in the full review of Luna’s Tattoo Concert ukulele, it features a comfortable C-shaped mahogany neck, with a rosewood fretboard and 18 frets, as well as some decent hardware. At under $100, the sound on offer is quite impressive, with reasonable projection and a good balance. For the price, this is an excellent choice for beginners! Beginners will love the playability and quality on offer from this American-made FLEA ukulele. For not much more than $200, you get an interesting almond-shaped uke, with a back and sides made from durable injection-molded thermoplastic and a birch top, finished in a range of colors. While we usually recommend avoiding plastic instruments, the sound on offer from the FLEA is very appealing and the bright, clear tone is more than suitable for beginners. It also comes with a comfortable hard maple neck, which offers good playability, and features a fast polycarbonate fretboard with 15 molded frets. Be sure to check out our full review of the FLEA Concert ukulele for all the details. What do you get when you cross a quality ukulele, a truckload of useful accessories, and good value? The Bondi Ukulele Starter Kit! This convenient bundle promises beginners ‘everything you’ll ever need to master the ukulele’, and we’re inclined to agree. You get a colorful protective case – which is actually one of the best cases we’ve seen in a bundle – as well as a clip-on digital tuner, felt plectrums, spare strings and loads of instructional help, including a free Skype ukulele lesson. The actual uke in this kit is very good too – a full-size concert ukulele body made from laminate sapele, with a rosewood fretboard and 18 frets. A superb consideration for beginners and intermediate players alike. One of the more expensive ukuleles on our chart, the Protégé U100CM from Cordoba still comes in at under $100, and shows very good value for money. It’s a great-looking little uke, with a concert body made entirely from laminated mahogany. The neck is also made of mahogany, with rosewood on the fretboard and a total of 18 frets. The whole instrument is satin-finished and therefore very sleek to play, while the craftsmanship is commendable, especially at this price point. As for sound, it’s also worthy of praise, as we mention in the full review of the Protégé U100CM – warm and sweet, with plenty of the desired ukulele jangle that beginners and experienced players crave. The reason this package takes our top spot is because of the awesome value it shows. The ukulele itself (choose between tenor, soprano or concert) is great quality for the price – made with laminated sapele on the body, with a smooth neck, rosewood fretboard and 15 frets. The back of the guitar is arched, which is a great boost to the volume, while the top and back feature protective and visually attractive ABS binding. The hardware is good, and includes strap pegs, while the accessories that come in the box really help cement this as the best-value package. It comes with a case and strap, while we highlight the full list of accessories in the Lohanu Ukulele Bundle’s complete review. A chart to highlight some of the best ukuleles for beginners wouldn’t be very good without a tenor uke, which is possibly the best size for bigger players, especially adults. Enter, the Cordoba 15TM. This well-made uke is 26” in length, with a sturdy body made from mahogany. It’s simple and sleek in design, with some fine elegant detailing like the abalone rosette and cream binding. Playability is great thanks to the mahogany neck, which sports a rosewood fretboard and a full 19 frets. As we highlight in the Cordoba 15TM’s full review, this uke comes with no accessories, but the hardware and sound on offer more than makes up for it. Great for beginners and experienced players alike. At under $60, this is the cheapest soprano ukulele featured on our list, but it certainly gives the others a run for their money where value is concerned. Kala’s popular KA-15S delivers a classic, no-nonsense style, with a traditional non-cutaway body made from laminated mahogany, with a smooth satin finish. Joined at the 12th fret, with all frets in the clear, there’s also a mahogany neck, along with either a rosewood or walnut (depending on the marketplace) fretboard. It’s actually quite standard in the looks department, but the beautiful sound impresses us the most – it’s bright and clear, with a fair amount of warmth. Be sure to read more about the Kala KA-15S in the full review. Time for something a little different – in looks anyway, as this PUKT55 from budget brand Pyle really impresses us. It’s an extroverted soprano-sized ukulele, with a lightweight body made entirely of artificially-flamed laminated wood, which is incredibly eye-catching and unique. It’s built solidly, and sports some equally striking decoration, including tortoiseshell body binding and engraved soundhole rosette. The neck is a more traditional mahogany, and features a 15-fret black walnut fretboard. The hardware is overall reliable and the playability is smooth, while – as we mention in the complete Pyle PUKT55 review – the sound on offer is more than satisfactory for beginners, with plenty of the sparkly soprano chime we all love. What the Mitchell MU40 Soprano lacks in a complex sound and striking design, it makes up for with great value and a quality that’s surprisingly good for not much cash. As the name reveals, it’s an attractive little soprano ukulele with a 21” length, a smooth-playing neck, and a rosewood fretboard with 14 easily-accessible frets. The body comes in four colors, including a Flamingo Pink (perfect for girls!) as well as a natural satin finish that shows off the grain of the lindenwood, which makes up the top, back and sides of this budget uke. As we highlight in the full review of the MU40, the sound is nothing special, but clear and loud enough for any beginner. Good work Mitchell! While there are certainly more options that will offer the playability, sound and value beginners need, the nine models above give you a good cross-section of the most popular ukes on offer. You may question why a $300 uke can have a similar rating as an $100 uke – this is simply because we rate every in instrument in relation to its price range. A $300 model will always show a better quality and sound than something priced at $50, but they may both rate highly in their individual price categories. So, without further chat, let’s take a look at some of the basics, what to look out for in a beginner’s uke, and where to go from here. If you’ve played guitar before, a ukulele won’t be too foreign for you – the two instruments obviously share some qualities. Similar to a guitar, it will have a body, a neck, a fretboard, a headstock, and a nut, bridge, saddle and strings. These are all obviously smaller than the components you’d find on a guitar (we’ll move onto sizes very soon), but will be familiar to those who have played a guitar before. One of the major differences is that standard ukuleles only have four strings, compared to a guitar’s six. Of course, some break the mold and add a fifth or sixth string but, in this guide, we’re only covering the popular four-stringed varieties. When it comes to frets, ukuleles typically only tend to have between 12 and 21 frets, while standard guitars will generally have between 19 and 24 frets. Less strings and less frets means less notes to get to grips with and easier chords to learn. Another aspect is that the strings have a lower tension, meaning less pressure is required to sound a note. So – compared to a guitar – the ukulele is easier to play. While similar, there are differences in the tone of a ukulele and a guitar. Ukes tend to be very happy and bright in sound, with instant connotations of Hawaii, although the size you choose (see below) will affect the overall tone. Guitars, with their extra strings and frets, obviously have a much bigger tonal range, and are louder when it comes to projection. This is quite an obvious one – a ukulele is smaller and lighter than a guitar, so it’s easier to travel around with. Compare the length of a 21” soprano uke with the 39” length of a standard guitar and you’ll see what we mean. This isn’t always true – naturally a high-end Martin model will cost more than an entry-level Rogue guitar, but in general, you get more value for your cash. They are smaller and easier for manufacturers to build. So, whereas the entry-level guitar market is anywhere from $50 to $200, the entry-level market is more like $20 to $100. The same goes for high-end models. In the guitar world, $1,500+ is considered high-end, whereas $500 will get you a pretty premium ukulele. While ukuleles come in many different sizes – including the tiniest pocket models right up to the biggest contrabass ukes – the most popular sizes can be placed into four categories: soprano, concert, tenor, and baritone. A soprano ukulele is the smallest of the popular sizes, with a typical length of around 21” and standard G-C-E-A tuning. With the smaller scale, it’s ideal for children or players with smaller hands, although that’s not to say adults can’t enjoy playing it. A soprano has a lovely bright, happy sound, although isn’t particularly loud due to the smaller body. For those players after the rich, classic ukulele tone, with slightly better projection, a concert uke is worth considering and probably the most popular size among beginners. Due to the larger body length of around 23”, the fretboard feels a little less cramped, so it can be easier for adults to play. The G-C-E-A tuning remains the same as a soprano. With a typical length of around 26”, a tenor uke offers a bigger, deeper sound that still retains the traditional ukulele tone, using the standard G-C-E-A tuning. With the increase in size, it becomes easier to play for adults with slightly larger hands. A baritone ukulele is the biggest of the popular uke sizes, with a typical length of around 29”. With its larger build, the baritone is particularly good for guitar players making a change, as well as those seeking a deeper tone. The typical baritone tuning is D-G-B-E​, which is five half steps lower than standard ukulele tuning (and identical to the highest four strings of a guitar). While everyone wants something that looks and sounds amazing (and you can certainly find it if you are prepared to spend the cash), the main thing to look for in a beginner’s ukulele is comfort and playability – a neck that is smooth with a low action. If you’re buying a cheaper model, you may need to get a good setup to optimize your action (see the section on setting up below). Another consideration is the size of the instrument. It’s no coincidence that our beginners chart above highlights soprano or concert ukes, because they tend to be easier for beginners to hold and play. If in doubt, go for a concert size if you’re an adult, and a soprano for a child. Of course, if you’re used to playing the guitar or have slightly bigger hands, a tenor or a baritone may be easier for you to move around. There’s no right or wrong, but – in general – you’re relatively safe with a concert uke. Having a ukulele with a decent sound is also important, so you can clearly hear what notes you are playing as well as feel encouraged when tunes and songs sound good (because it’s certainly discouraging to play a song well and still have it sound like garbage!). Those on our chart all succeed in giving an average to very good sound, depending on the model. While entry-level ukes won’t have the complexities and richness of a higher-end solid wood options, you’ll be fine as long as the sound is clear. Talking about sounds, if you are a beginner, there’s no real need for electronics. Think about whether you really need to amplify your sound. If the uke you love comes with electronics, consider it a bonus – but it’s not a necessity, and should be the last thing you consider. Finally, if you’re serious about the ukulele, and your budget allows, it is probably worth buying something a little more expensive. We’re not talking a high-end, American-made masterpiece, but by splashing a little extra cash, you will usually end up with an instrument that looks great, feels smooth, and has better sound than something in the budget category. In some shape or form, yes – you need some sort of instruction if you are a beginner. This could be as basic as buying a book on learning to watching some YouTube video lessons – there are literally hundreds of great beginner lessons out there. If you are more serious about learning, enrolling in an online ukulele course or taking lessons with a local professional teacher (either one-on-one or group sessions) is a good way to go about things, and will give you a great foundation for your future playing. As we’ve mentioned in some of the individual reviews, while the cheaper models on our chart and beyond are fine instruments, some of them would benefit from a good setup after delivery. It’s not essential, but by lowering the action, filing any sharp frets, and changing the strings, a sub-$100 uke can look and feel like a much more expensive instrument. There are many guides on setting up and intonating a ukulele online (including the video below), although if you are a complete beginner, spending a few dollars on a professional setup from your local guitar pro may be the best way to go. With four main styles/sizes of ukulele – soprano, concert, tenor and baritone – it may be a little confusing to beginners which size is the easiest to play. We have highlighted the sizes and their tonal profiles in more detail elsewhere in this article, but we generally suggest learning on a concert or tenor ukulele. These two sizes provide adult beginners with a little more fretboard room to work with and an easier instrument to hold when compared to the very small soprano. However, note that a soprano ukulele may be better for a child, as smaller hands can deal with the smaller fretboard much easier. Whatever your size, it is worth avoiding a baritone ukulele as a beginner. While this lovely style of uke can be great to move onto, the initial change of tuning to D-G-B-E can be confusing for those learning for the first time. The joy of a ukulele is that it is a relatively cheap instrument to get into – even a premium high-end uke won’t set you back much more than a thousand bucks. However, as a beginner, there is no need to spend anywhere near that amount, especially if you haven’t tried playing one yet (you may realize it isn’t the instrument for you). Because these days so many brands offer ukuleles, the standard is all round much better. However, there are still some awfully cheap models on the market, and anything under $40 starts to fall into the ‘toy’ category. Of course, there are exceptions, but to be on the safe side – and to end up with something that is playable and sounds good – we suggest spending over $50. If your budget allows and you feel that the ukulele is an instrument you will stick with, spending anything between $75 and $200 will land you with something worth practicing and performing on. This amount will also allow you a big range of choice when it comes to brands, models and sizes, as well as designs and tonewood choices. The joy of a ukulele is the fact that you can take it anywhere and make sweet music without the need for extra accessories. Taking a ukulele to the beach is a lot easier than taking an electric guitar, cables, amp and power generator! However, beginners will still want to invest in a case for the uke, as this will make transporting and storing the instrument easier and safer. Some ukuleles will come with their own case, so make sure you check first before buying twice. You may want to buy a strap to help support the ukulele when playing standing or seated, although these aren’t a necessity as the ukulele is a light and easy-to-hold instrument. A digital tuner is another accessory worth considering. These relatively inexpensive devices will help you tune your uke correctly. While we’ve highlighted some excellent instruments for beginners that span several price ranges, there are hundreds of other ukes that you may prefer. While we can’t chart them all, buying something from the top brands such as Kala, Lohanu, Lanikai, and Luna, or famous guitar brands that make ukes, including Cordoba, Fender, Ibanez, Martin and Epiphone, will usually see you safe. When you have settled on a shortlist of models that really appeal to you, start narrowing it down by watching videos, listening to audio files, reading reviews, and – if possible – actually trying it out. You’ll eventually settle on one that you love. Good luck with your hunt for your perfect beginner instrument, and enjoy learning this wonderful instrument!